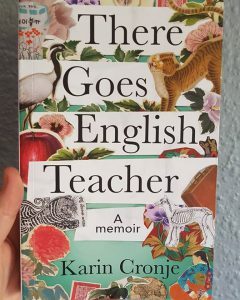 I went book shopping a little while ago in one of my favourite second hand bookshops and I found it in the travel section, i often look in the travel because though I don’t do much of it myself, I do enjoy reading about others that have. Not all of them mind you, I like the quirky and interesting travel books, I remember one that I read a good many years ago called Around Ireland with a fridge, again I thoroughly enjoyed it. So, when I discovered this tome of a book, it was a given that it was coming home with me! 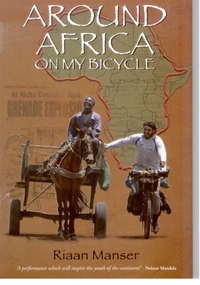 Firstly, I have to say, that I could never travel around Africa on a bicycle, the main reason being is that I cannot ride a bicycle, well, not very well and definitely not through terrain like Riaan had to traverse. So, why did I enjoy this book so much, that it even inspired me to go searching google and find him so that I could request an interview? My first and foremost reason, is that he travelled Africa. Yes, I am born and bred South African but I have not travelled further than the Eastern Cape. I have not had the pleasure of meeting ‘real African wild life’ (bar from the animals that I see on the game farm on the way to and from my daughter’s school – including a zebra which seems to have come out of hiding and elephants at Addo), I haven’t experienced ‘African Food’ and the people of Africa are of such a wide array, I can honestly see why we are called the Rainbow Nation. but he did, and on a bicycle no less! 36 500 kilometers and 34 countries,with experiences that most of us would cringe at. I have the utmost respect and admiration for someone who can put away the creature comforts of our Western civilisation, go it alone and appreciate each and every one of his experiences. And experiences he had, many of them, which personally I think could shape ones internal life, spiritual and physical. “Here I seemed to understand things about myself and the world itself that I had never understood or even thought of before. Like finding the places to put difficult puzzle pieces of a giant puzzle. nothing flashy happens but inside you know and understand that the puzzle is nearly completed. I don’t think it could have happened anywhere else on the planet.” – Riaan Manser. Travelling from the V&A waterfront all along the coast line and coming back into Cape Town again, Riaan met many people on his journey, both good and bad and what I really enjoyed about this book is that he doesn’t hold back on spilling the beans on the ‘bad’ people. Both sides are mentioned but it is refreshing to see that usually kindness wins out on the most part. With a good few terrifying experiences, Riaan faces many of his fears in his determination to circumnavigate Africa. It is a truly inspirational read and I urge to find yourself a copy and get stuck into its 700 pages, for South Africans and non South Africans alike, this will open your eyes to our country and its vast array of different people who inhabit it.